What do I need to use 1Home ? 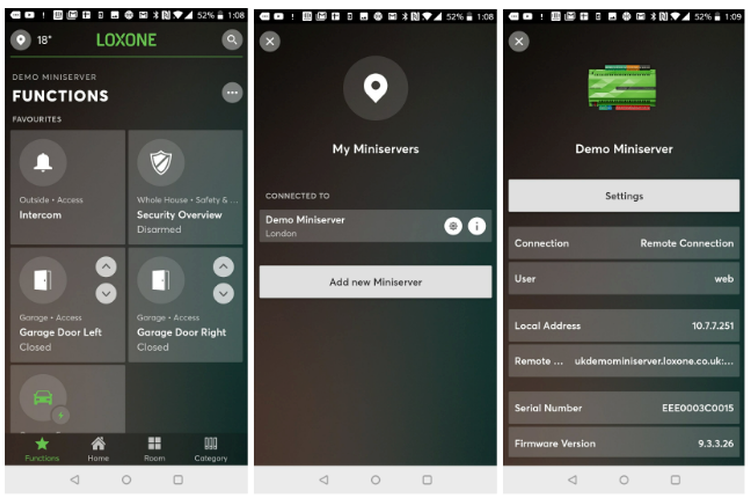 You need a configured Loxone Miniserver or Miniserver Go, prepared for remote use via the Loxone mobile App. This configuration is usually done by a professional installer. If you do not have the remote access configured please contact your installer. How do I connect 1Home to my Loxone Miniserver? Hostname or external static IP: Please enter the external address of your Loxone Miniserver. Example: mustermann.dyndns.com. Please do not enter internal network IP addresses like 192.168.X.X, 172.X.X.X, or 10.X.X.X. Also please do not enter the http:// as part of the address and note that you need to enter the port number in a separate field. External static IP and other DNS address are also supported. Alternatively you can connect using Loxone CloudDNS. Please enter the server serial number which can usually be found in the Loxone mobile app. Username: Please enter the Loxone mobile App username for your Loxone Miniserver. Password: Please enter the password for your Loxone Miniserver. If you do not remember the password please check with your installer. Press the "Save" button and if the connection details are correct, 1Home will recognise all your devices in your Smart Home. Click on the Devices tab at the top of the page to access the list of all detected devices. If you have issues connecting 1Home to your Loxone Miniserver, please contact our friendly support team at support@1home.io or via the blue Chat bubble in the bottom right corner. Please take a look at our 1Home Box device, which eliminates the need for Port Forwarding, dynamic DNS or externally accessible IP. 1Home Box device enables Remote Access, HomeKit support, IoT Orchestration and faster voice control. The device is simple to use and requires no technical knowledge, simply connect power & network and the device is ready to go. Which Loxone Miniserver devices can be controlled through voice using 1Home? 1Home detects all Miniserver devices which are available through your mobile app and which makesense for voice control - lights, switches, scenes, blinds and thermostats. You can find a complete list of all supported commands in the Voice Control FAQ.